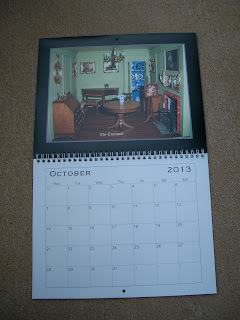 The Tenement: I'm pretty pleased with this idea! I'm pretty pleased with this idea! I've had to wait until after Christmas to show you all this. It was intended as part of my sister's present and I know she occasionally pops into this blog to see what I'm up to so I took the pictures before wrapping it! 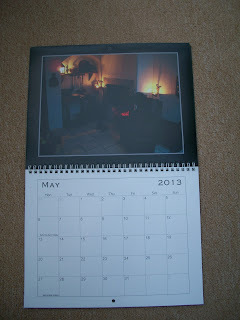 I was watching tv one night and an ad came on for one of those services* that enables you to create a personalised calendar from your own photographs and I decided to give it a go. Nothing could have been easier! 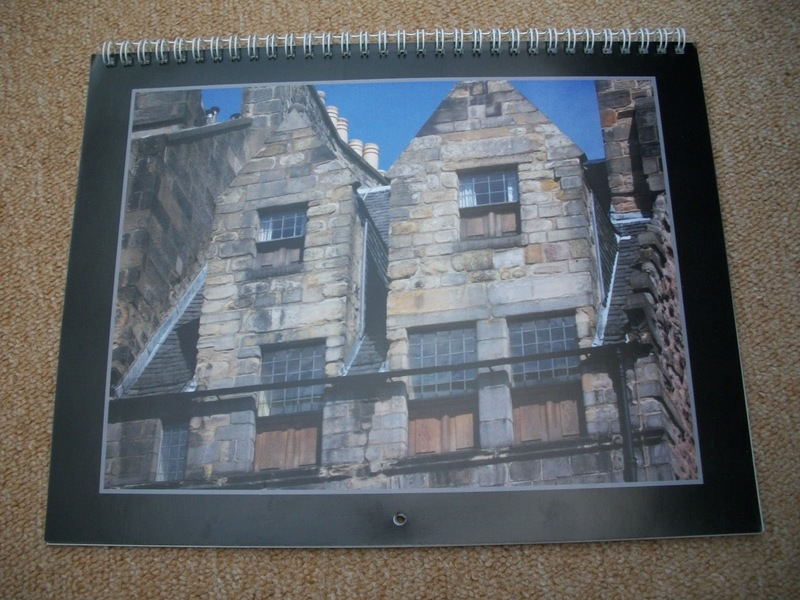 I wont bore you all with every page but suffice to say there is a different photo of the various rooms in The Tenement for every month and the system also enables you to add important dates in the relevant places. I could also have had a mug decorated with a photo too - how good is that? 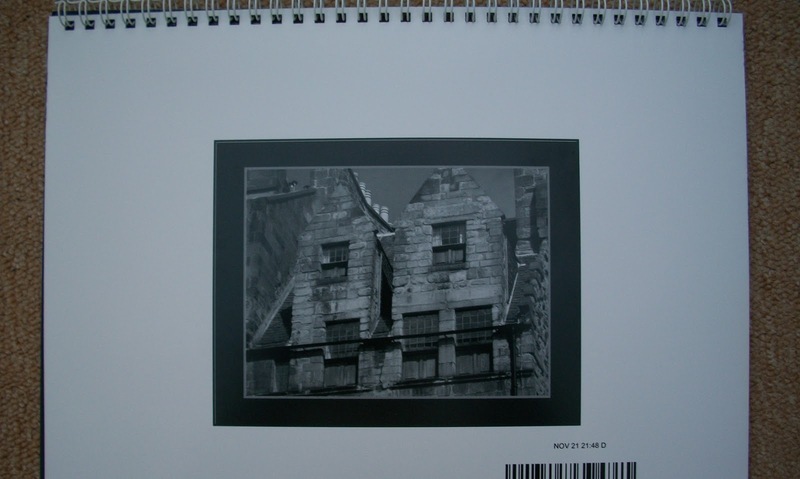 On the back is a neat little black and white copy of the front cover which show the attic windows of the real life building. I'm really pleased with the way this turned out - a great idea for that "little something" if you're struggling to think of a gift or stocking filler and a great way of showing your mini creations too! I can also now add that it was well received and went down very well! What a Wonderful idea, Irene!!! I could see myself with a Calendar of Minis.... keeping me company at work... lest I forget Why I am working... Lol!!! 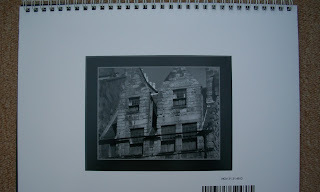 The Tenement looks Great in print! What a great idea! I'm sure she'll love it. Doesn't the green room come out well. My sister and I were driving back down having been up to my Mother's for the weekend before Christmas, and as we came down the A3 through the Borders we passed a sign to Netherton!! 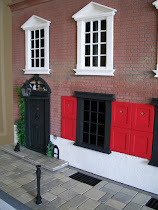 Would this be the same Netherton that is the name-sake for your House? I remember you explained where the name came from, but can't remember now. It was funny though, I had to bring up your Netherton Blog there and then, in the car, and show her! I hope you had a lovely Christmas too. Do you know, I had no idea there was a Netherton in the Borders! I suppose I should as hubby hails from Dumfries. Anyway, my Netherton came from the name of the holiday cottage the family owned in the late 1800s in Kirn, a village in Argyll. Nothing as grand, I may add, as the one now standing without doors in my new hobby room! Dear Irene, that great idea! Among other things, when printed on paper, the picture becomes DEFINITIVE dimension. Hi Irene! What a lovely gift for your sister. She must have been thrilled! It looks really great, I'd never have thought of it! Something to store in the back of the mind for next year. Wishing you everything you hope for in the New Year Irene. 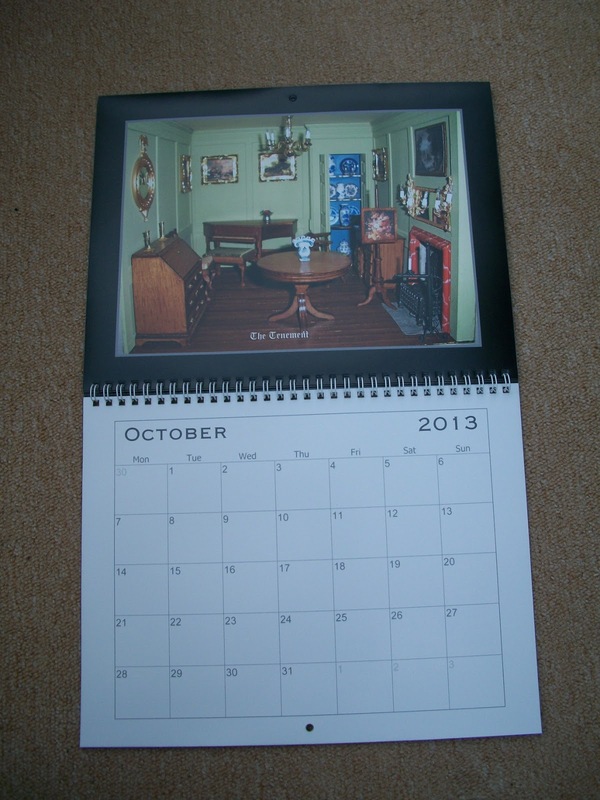 That's a fab idea - it certainly beats cats and gardens, the type of calendar I usually get! You could go into production - I certainly would like a view of the Tenement every month! That is absolutely brilliant, Irene! Your sister must have been thrilled. 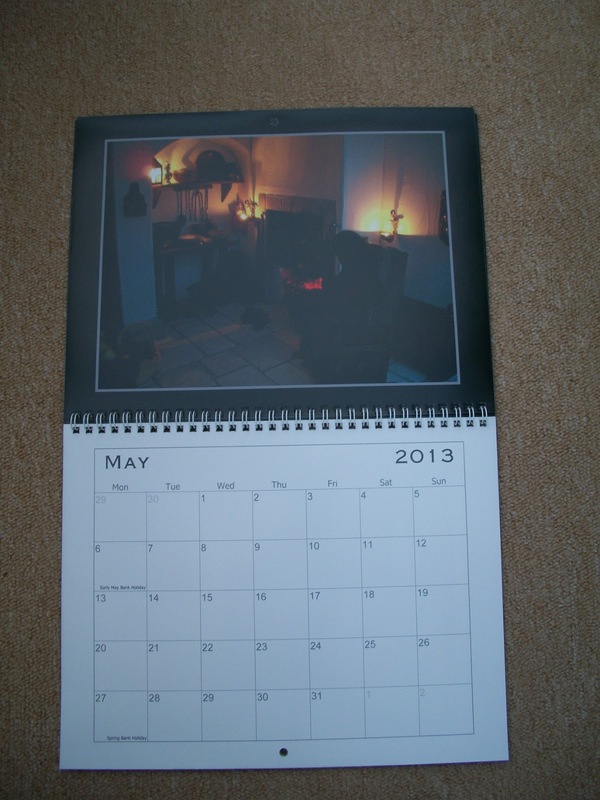 Just want to say I'm delighted with the calendar. When Irene said it added 'important dates', yes, her birthday is in there. (as if I could forget that one). That looks so nice, what a Wonderful idea. I wish you also a happy 2013. Lots of kind regards, Alexandra. Amazing! È' bellissimo, Irene! Bel regalo per tua sorella! The Tenement per 365 giorni piacerebbe anche a me. La sala verde e grandiosa. Buon fine e buon inizio, dear! 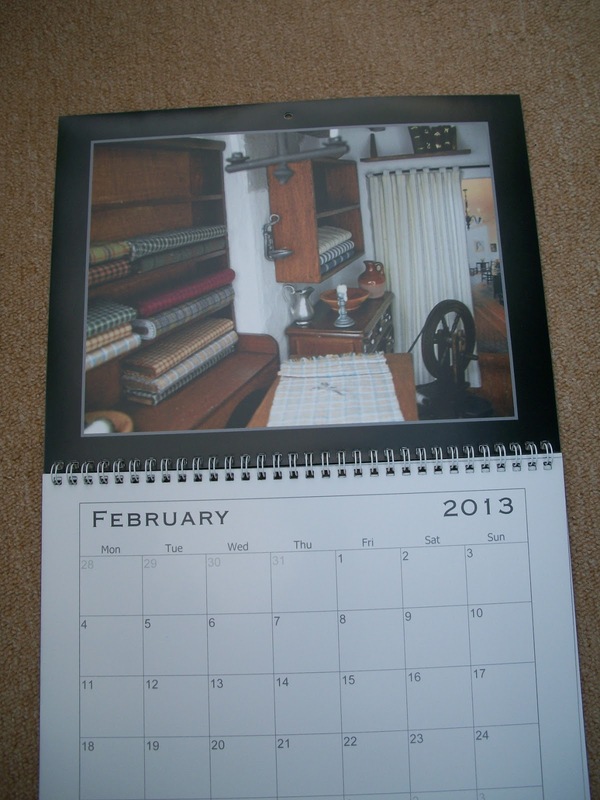 I think you may have started something here, it's the perfect gift, I just might get my self organised for a 2015 calendar. That is such an amazing idea! I love it! What a wonderful way to showcase such an amzing project! The pictures are beautiful.